Authentic linocut and woodcut illustrations require a variety of specialist tools, patience and skill, but there’s a way to have fun producing similar artwork styles but with the safety net of the Undo button. My free set of 25 brushes for Adobe Illustrator help you carve your own designs digitally while achieving the linocut and woodcut look. Choose from a range of brush shapes, including tapered strokes, texture fills, split brushes and edge shading to construct your illustrations with realistic techniques, but in less time and without the frustration of making a permanent mistake! 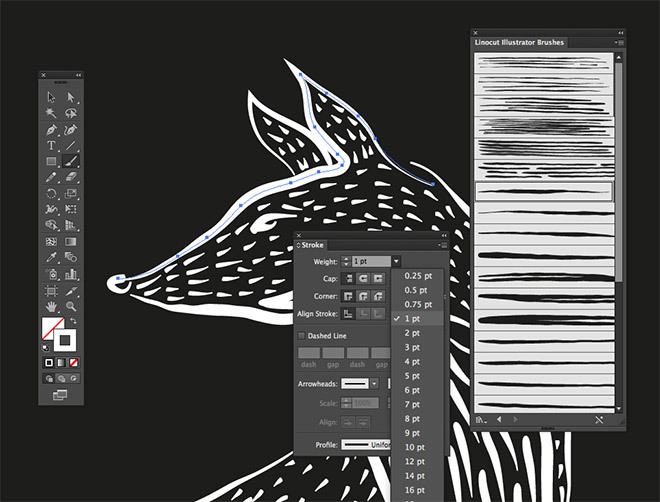 The Linocut Illustrator Brushes Ai file in the download package can be opened as a brush library from the Brushes panel in Adobe Illustrator. Alternatively, opening the file directly will give you a series of paths with each brush already applied, which can be copied into another document to automatically transfer the brushes into the Brushes panel. 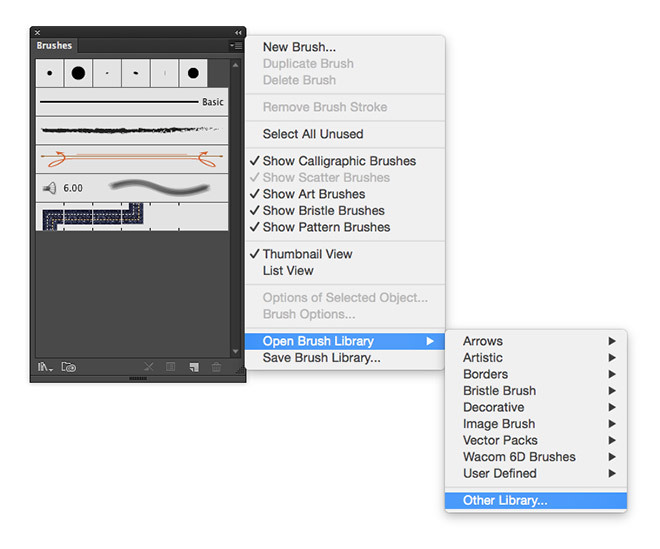 Use the Brush tool to draw your illustrations and select a brush style from the library. A graphics tablet can make the illustration process easier, but since the pressure and tapering effects are built into each brush, the same results can be achieved with a mouse. The Stroke weight can also be used to adjust the size of the brush marks. Love this design? Get the t-shirt! 40 Comments submitted Add yours! Dude. It’s been a while since I visited your site, but I remember learning how to do vector cartoons on here…probably over 10 years ago. Back when the site had all those loops and paper planes and stuff at the top if I remember correctly. Thanks for all the value you’ve given through the years. I hope it’s rewarding you greatly. I wish I had been able to check in on this post sooner but I’ve been out all day. I’ve just uploaded a fresh version which includes a CS version of the brush file, which I hope will work in <CC versions of Illustrator! Would love these but have CS6. Don’t suppose they could be made available for that too? I’ve just uploaded an updated file. Can someone report back and let me know if the CS version works? Yes, it is working in CS6. Thank You! The revised brushes are working in CS4. These are awesome. Thank YOU, Chris Spooner!!!! Thanks so much, Chris! I’ve been looking for something like this for a long time! Linocut – brushesh are great but I prefer use my hand to do it in my own time for relaxation. Great job, thanks a ton! A nice freebie again, thank you. 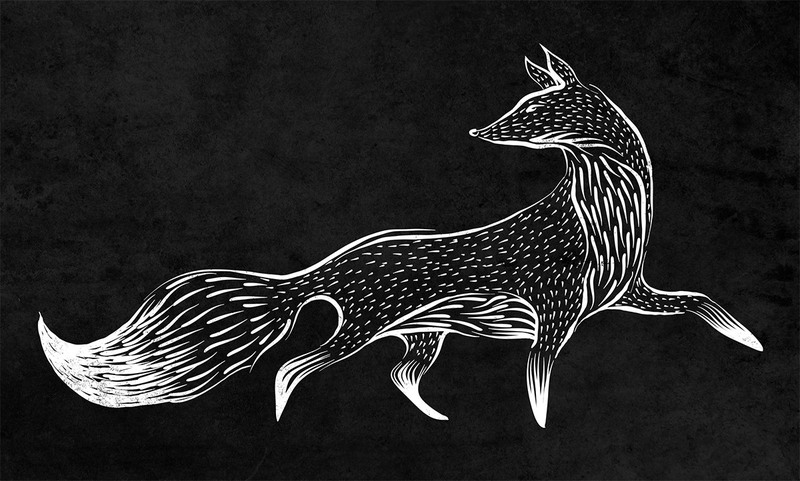 Is there any possibility to to a tutorial to create this fox or some else animals in this style? This is so useful! Thanks a bunch! Oh, wow! I am going to try these out! Thank you! Great brushes pack. It works with CC2015. Love it! Thanks a lot!! Thank you, Chris, for the marvie lino brushes, which are great. But O!M!G! … the fox! I am dying for the fox! Is there any possible way? With hope, -k.
these are great! Thank you!! thank you! Going to have a lot go fun using these. Wow, beautiful brush set, thank you! I love these. they don’t work in CS6. Any chance we could get them in CS 6? Thanks! So these won’t work for CS5? I hope they work in my CS6. I likes! Thank you! Thanks so much for these Chris. Brilliant! Thanks you very much, they are lovely! I think your blog- website is great! Is this brush set free for commercial use? i’am beginner. where video tutorial to draw as above ? These are awesome. Thank you for being SO generous! Would you like to download ALL my resources in one go? Get more goodies just like this by subscribing to my mailing list. Every subscriber gets a free design resources bundle of 100+ vectors, brushes, textures and more!